Cruises from Istanbul depart from spring through fall. 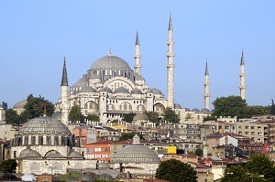 Istanbul, Turkey is one of the world's most interesting cities. Cruise passengers get a striking view of the minaret-pierced skyline as the ship pulls into port. The treasures are plentiful here; visitors marvel at the great architectural triumph of the Blue Mosque, the glorious frescoes and mosaics of the Chora Church and the amazing Grand Bazaar. Driving is not recommended. Please present the taxi driver with the address. Parking is at Karakoy Otopak. Rate of 17.00 euros daily and payment in cash only. Directions from Ataturk Airport: - Exit from Atatürk Terminal and continue onto Ataturk Havalimani Ave. At Havuzlu intersection take the 3rd exit onto Rauf Orbay Ave. (Yesilkoy – Bakirkoy coastal road). Continue onto Eminonu direction. Pass though Galata Bridge, turn right and continue onto Kemeralti Ave. (Kabatas direction) 5.Keep on the right lane after passing though Istanbul Modern Museum. On Meclis-i Mebusan Ave. Turn right to port after passing though Salipazari bus station. Directions from Taxim: - Head west on Taxim to Siraselviler Ave. After passing though Garanti Bank turn left to the Kazanci Hill. At the end of Kazanci Hill, turn right to Meclis-i Mebusan Ave. Keep on the left lane when you see the Nidya Hotel and make a “U” turn. On Meclis-i Mebusan Ave. Turn right to port after passing though Salipazari bus station.